A snapshot of 24025 at Swindon Works on June 12th 1977, a month later the remains would be broken up. This view clearly shows the five grills on the top row, the split level frost screen and the headboard/disc brackets on the No.1 cabfront. Does this suggest that a switch of bodies was made between 24025 and one of the early series Class 24s? Who knows - see below. The sixteen year three month career of D5025/24025 saw allocations to Eastern Region and London Midland Region depots. 1959 - 1969: Four upper and four lower air filters on non-BIS side, three upper and four lower on BIS side. 1969 - 1976: Five upper and four lower air filters on non-BIS side, four upper and lower on BIS side. Circular gauge added to fuel tank (1969). 24025 was stored at Reddish from July 1975 until January 1976, when it was moved to Crewe and stored there until January 10th 1977 when it was forwarded to Swindon and broken up there by the end of July 1977. Movement: 24025/29/33/34 06.45 Crewe - Swindon Works January 10th/11th 1977 hauled by 25269. Noted Stratford Works January 1960. Noted Derby Works August 1961. Noted Derby Works January, February (collision damage) & August 1963. 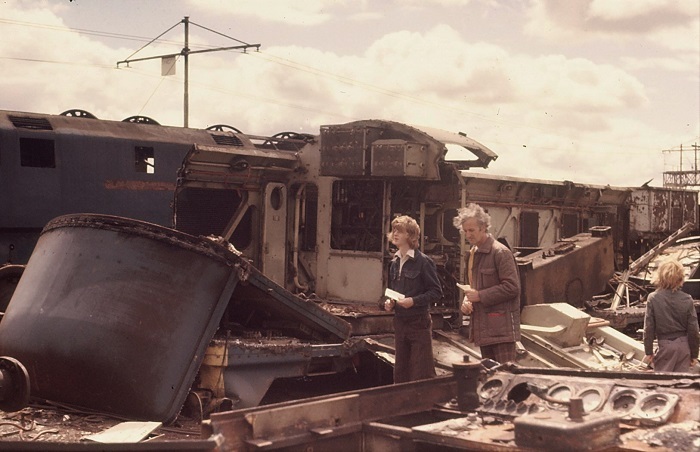 Noted Derby Works April - June 1973 (collision damage). Photograph courtesy Paul Sturm. 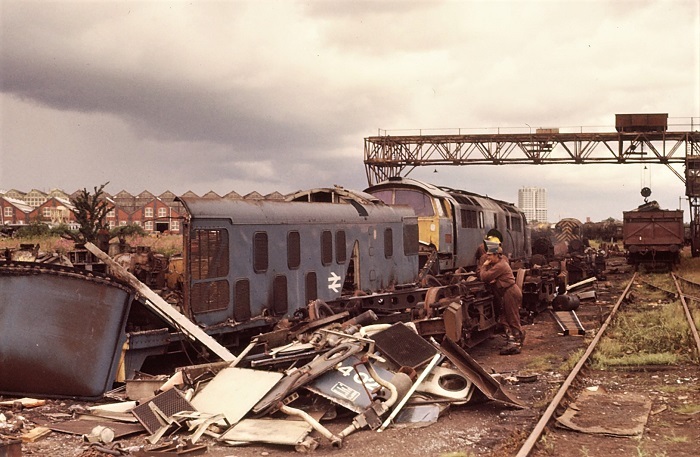 A visit to Swindon Works during July 1977 finds the scrappers have almost completed their work on 24025. Photograph courtesy Paul Sturm. A view from the other side of the locomotive as enthusiasts wander through the debris. If one accepts that 24025 is really 5005 following the identity swap at Derby during 1969, of the original twenty Modernisation Plan Class 24s built, Swindon Works broke up only two, 5005 & 24005. D5025 was new from Derby Works during October as part of the second Derby order D5020 - D5029. D5025 officially entered service on October 16th being allocated to Ipswich (32B). Derby Works Test House on Sunday October 4th 1959, ex-works D5024 is on the left, to the right, according to the photographer's notes is D5025 in pink primer and undergoing electrical testing. This view clearly shows that D5025 has the expected number of bodyside air filters, three on the top row, four on the bottom - one of the bottom filters has been removed to allow the running of the electrical cables into the engine room. Compare this view of the one further down the page at Crewe in 1975, clearly showing four air filters on the top row. 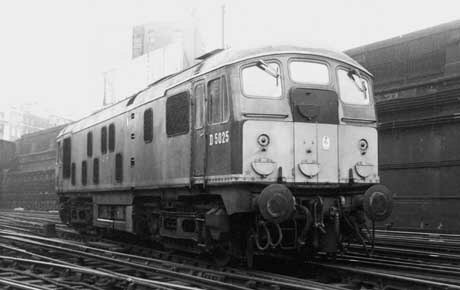 D5025 was transferred to Willesden (1A) during July 1961, and was noted at Derby Works during August. D5025 was noted at Derby Locomotive Works during January & February with collision damage to the No.2 cab, which is believed to have occurred early in December 1962 after the locomotive collided with some carriages in fog. D5025 was noted on Crewe North shed on February 14th. D5025 visited Littlehampton with an excursion from Hemel Hempstead on May 22nd. Late in the year, during December D5025 was transferred to Bletchley (1E). During April D5025 became part of the London Division (D01) allocation, then moved northwards in July to the Birmingham Division (D02). D5025 made the move north to the Stoke Division (D05) in August as part of the big transfer of the Class 24s to the Crewe/Stoke/North Wales area. Noted Derby Works during October. Noted Derby Works during December. Noted Derby Works April - June for collision repairs, from damage recieved in the Birkenhead area early in February 1973, whilst in Works it was transferred to Crewe and then Longsight in May with 24026/27/29. A rather sorry looking 5025 stands at Birkenhead on February 10th 1973. Despite the considerable damage sustained the locomotive was moved to Derby Works for repair. 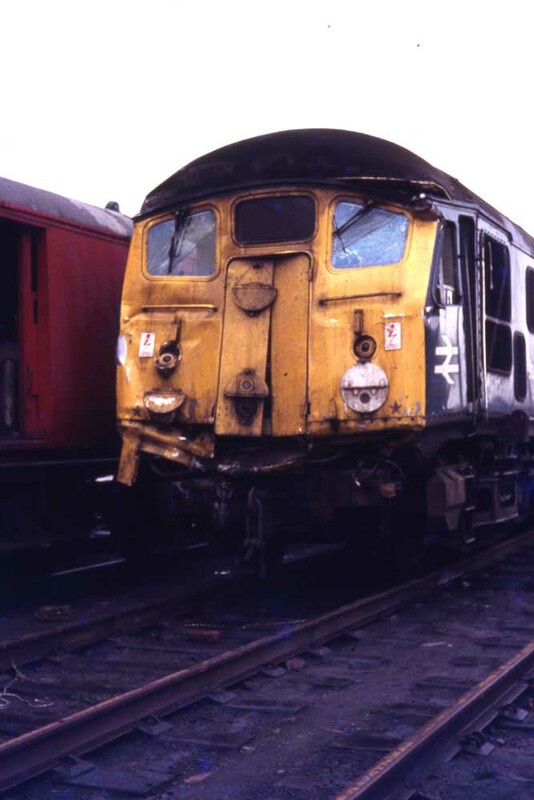 Presumably Derby replaced the damaged cab with a new or reconditioned one, but interestingly the long obsolete ex-Southern Region headboard/disc brackets were retained following the collision repairs - compare with the views at Swindon or Crewe. 24025's last transfer was to Crewe in May, by July it was one of many taken out of service and placed in store. 24025 remained in store until finally withdrawn at the end of January, continuing to be stored at Crewe. Photograph courtesy Tony Sayer 24025 in store at Crewe on September 25th 1975. 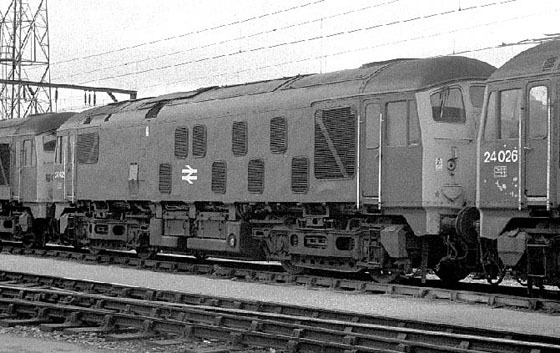 The locomotive clearly shows the four upper & lower grills, normally associated with the early build of Derby's Class 24's. Also visible on the near cab is one of the headboard brackets. This also shows the radiator frost screen without the midlevel break. On January 10/11th 24025/29/33/34 formed the 06.45 Crewe - Swindon Works hauled by 25269. By July the scrappers at Swindon had finished their work on 24025. That a machine is simply the sum total of its parts is clearly evident in the construction of a steam, diesel or electric locomotive. Many interchangeable components make up a locomotive, and at the times of a Works visit these worn parts are removed and replaced by similar new or repaired items. At these times the identity of a locomotive can become fragmented, in particular with steam locomotives, whose main components - the boiler and the frames don't carry an easily visible number which might be used as a method of identification for the whole locomotive. For BR's diesels and electrics the body is usually the largest and most visible 'component' and the most obvious one to stick a number on which will follow it through its career. Of course from time to time identities may get mixed up, usually when locomotives are in for a heavy repair, especially at the stage when the repaired locomotives are receiving a fresh coat of paint and are having their numbers added. D5025/24025 seems to have been one of those locomotives that underwent a most severe identity crisis. From the collection of Real Photographs Co Ltd (their ref R8253) comes this view of the problematic 5025 with the body style that is more typical of one of the earlier Derby built machines. This view is at Crewe sometime in 1969. If one of the early machines was at Derby alongside D5025 a numerical switch could have taken place. 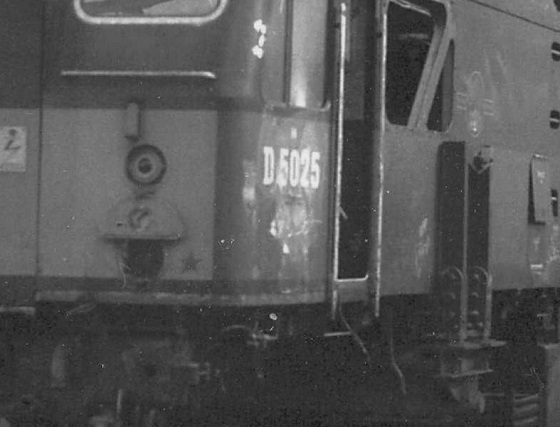 The numbering on the above view and the reasonable condition of the paintwork suggests 5025 must have been at Derby Works sometime during 1968 or very early 1969. There is no suggestion in the photograph that the 'D' prefix has been painted over as happened so frequently in the post-steam era. 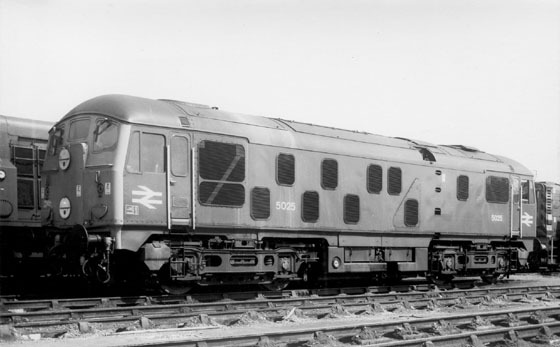 D5025 was part of the second Derby built batch D5020 - D5029 and so carried with it some significant changes that clearly made it stand out from the first twenty built at Derby. As built the early members of the batch carried on one side five grills on the upper body panel and four grills on the upper body panel of the opposite side. Unfortunately in those first twenty locomotives this was not a uniform standard, some carried one grill less on each side and this was carried through to D5020 - D5029! As a young spotter in the early 1970's these fine detail nuances would have been completely lost on yours truly when we came across 5025! However a visit to Swindon Works during June 1977 found 24025 parked in an uncluttered spot leading to the typical photograph being taken. Which like most was filed away for a rainy day viewing. And eventually a close examination of the slide showed that 24025 was not all that it should be. Unlike its sisters in the D5020 - D5029 series, 5025/24025 in later photographs carried the extra ventilator grills found on each side, normally associated with the D5000 - D5019 series. It also carried on one side only one of the split frost screens originally fitted to D5000 - D5006. And perhaps the strangest of all is that both cabs carried the headboard brackets that were fitted to D5000 - D5014 & D5017 when they operated on the Southern Region. And thrown into the mix was a photograph from the Real Photograph Co. showing all these unusual features in a photograph taken back in 1969! A view which supports the identity change for 5025/24025 is this early 1960's view of D5025 at Euston. The features are typical of the D5021 - D5029 locomotives, D5025 even has the two-rung steps on the bogie. As expected there is no evidence of the Southern Region headcode brackets. (A similar view of D5025 at Willesden taken during July 1964 from the C Bush collection showing the same side agrees with the view here). Photograph courtesy R Simpson, collection of Graham Wareham. Since the complete photographic option is not yet currently available to me its down to a little bit of sleuthing to see if the mystery with D5025/24025 can be clarified. At this point a detailed survey was originally contained within this webpage of the detail differences of D5000 - D5019 and how these changes may have affected D5025/24025. However a photograph at Derby Works taken during 1969 of a locomotive purportedly numbered as 'D5025'came to light and answered the question with a great deal of certainty. 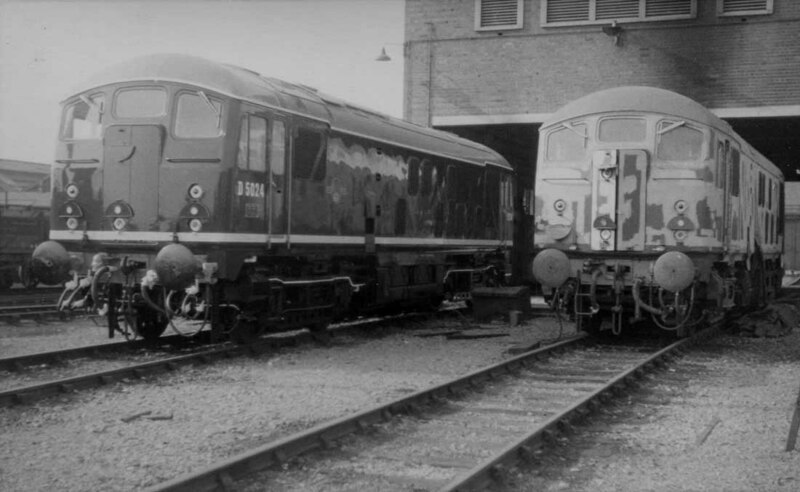 The supposition that maybe D5005 and D5025 swapped identities whilst they were both at Derby Works during 1969 now appears to be what actually happened. 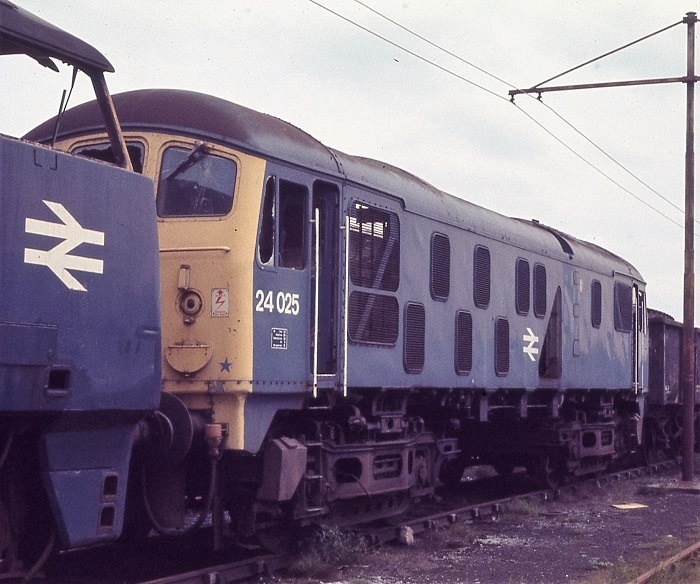 The photograph below is taken at Derby during 1969 and show a Class 24 numbered as D5025, but the livery is that of the two tone green style which was only carried by a few members of the Class and D5025 was not one of them. And since the livery was carried by D5005 and the photograph show a locomotive with the characteristics of the D5000 - D5019 batch it therefore draws the conclusion that essentially the view below is of D5005. Of course it would be interesting to see photographs (if any exist) of the locomotive that was broken up at Derby represented by D5005. Presumably this was 'D5025', possibly with accident or fire damage or general poor condition. At this time there were already a number of Class 24s in store, with the first batch built (D5000 - D5019) being hitlisted, so it was of no surprise to find D5005 withdrawn at this time. Photograph courtesy Brian Lockwood / Collection of Transport Topics, Martin High. 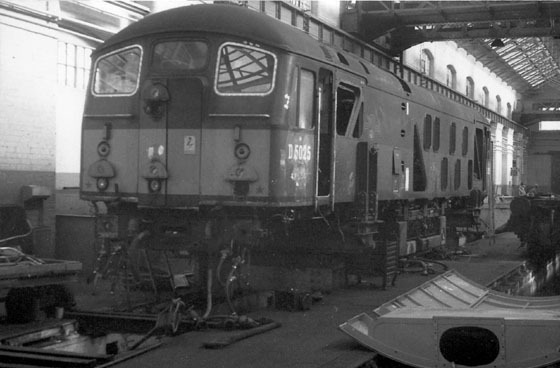 D5025/D5005 in the main erecting shop at Derby Works sometime during 1969, with the body & cabs of 5005 now numbered as 5025. A close-up from the above view showing the two-tone green livery and headboard/disc bracket carried by 5005, the altered number and the missing builder's plate. With thanks to Martin High of Transport Topics for allowing use of the D5025 view at Derby Works during 1969, Thank You!! November 2nd 1969 - Outside new paint shop 5005 (withdrawn). Page added September 15th 2007. Resources: additional research provided by Mark Sutton.